Act 1 Prelude "Les toreadors"
L'amour est un oiseau rebelle "Habanera"
Pres des remparts de Seville "Seguidilla"
It's hard to believe that Maria Callas died almost three decades ago, on September 16, 1977. Today, there is as much interest in her life and her artistry as ever, even among those who had not even been alive when she died. However, I would like to think that the reasons why Callas still holds us in her thrall are artistic. Here was a singer unlike any other in her century. She was a very intelligent woman and a serious artist, and she attempted to bring an uncommon musical and dramatic authenticity to her roles. In many ways, she was influenced less by her immediate predecessors and more by the great divas of the 1800s, who created many of the roles for which she later became famous. Her voice? Unmistakable, from those incredible chest tones to those penetrating high notes. Once you hear it, you'll recognize it again immediately. She was one of the greatest operatic actresses, not just because of the way that she moved and looked on stage, but also because of the way that she sang. She could color her voice to say anything she wanted about the character she was playing. Although as a person, Maria Callas had her moments of self-indulgence, as a singer she was completely at the service of the composer and his music. Even in recital, away from the costumes and staging of the opera house, she was a master of interpretation and meaning. She was a lot more than a pretty voice. Later in her career, as her voice deteriorated, she remained a satisfying performer because her personality and intelligence remained so strong. All of these CDs (with the exception of the last, I suspect) previously were issued as individual EMI Classics CDs. Sensibly, the label now has packaged them together, using card-stock pockets, in a much thinner "clamshell," albeit only with the briefest of booklet notes. This is an economical way to go, for sure, but no doubt the many fans who already bought the individual CDs will be tearing their hair out over this repackaging, particularly if they do not have the conversation disc. From early in her career, it was striking how Callas juxtaposed coloratura heroines, traditionally sung in previous decades by twittering sopranos such as Lily Pons, with heftier roles that Pons and her ilk would not have touched in a million years. The Rome recital (with Rome's Orchestra della RAI and conductor Oliviero de Fabritiis) is a fine example of this: Verdi's Lady Macbeth and Abigaille are followed by Donizetti's Lucia and Delibes' Lakmé, and it doesn't seem ridiculous or misguided at all. Granted, Delibes' Indian priestess does not give Callas much to sink her teeth into, dramatically speaking, but the coloratura is impressive. (Truth to tell, though, other singers jumped those hurdles better than she did.) Even with the conductor's excessively leisurely tempos, Callas creates a malevolent Lady Macbeth. She would be even better in this role later on – see below. The San Remo material (Orchestra della RIA conducted by Alfredo Simonetto) offers similar juxtapositions: Mozart's Konstanze ("Martern aller Arten" is sung in Italian as "Tutte le torture") and Meyerbeer's Dinorah are put in their places by Rossini's fearsome Armida! In between, Charpentier's dreamy Louise ("Depuis le jour") displays the soprano's skills as a lyric soprano as well. All of this is most impressive. The voice is in excellent condition throughout this CD, and the sound has held up very well over the decades. More unexpected juxtapositions here: from Milan, we hear both Thomas' Ophelia (Hamlet) and "Tu che invoco" from Spontini's La vestale, which pretty much belonged to Callas during this decade. In Athens, Ophelia (again) rubs shoulders with Isolde (! ), with Donna Elvira (Il trovatore) and Donna Leonora (La forzadel destino) to mediate. Once more, Callas moves through the two programs with assurance, and with an intelligence and dramatic aptitude that were far from the norm during the 1950s. While you will admire her Ophelia, though, it is her Vestale Julia that you will remember for its tragic grandeur. Her Isolde is a force of nature, too: she is volcanic and self-hypnotized in "Mild und Leise" (here rendered as "Dolce e calmo"). Simonetto conducts the Orchestra della RAI, Milan on the first half of the CD, and Antonino Votto conducts the Athens Festival Orchestra on the second half. Here's something a little different: Callas not in recital, but getting ready for one. We follow the established pattern: the roles are Verdi's Violetta, Donizetti's Elvira (I puritani) and Anna Bolena, Lady Macbeth, and Konstanze. 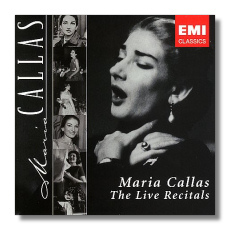 This disc is more interesting as a glimpse into the workshop than as the presentation of a finished product: there are lots of stops and starts, and sometimes Callas doesn't sing out with her full voice, or she takes a high note or passage an octave down. Nicola Rescigno conducts the Dallas Symphony Orchestra and Chorus. The sound is more recessed than on the previous two discs, but still acceptable. The sound really gets in the way on this disc. In fact, it is terrible. Still, it is worth listening as hard as you can in order to take in Callas' truly nightmarish Sleepwalking Scene from Macbeth. Puccini was only infrequently included in her recital programs; here we have her Tosca, Mimì, and Butterfly, and Callas sounds a little uncomfortable in the last of these. Even "Casta diva" no longer sounds as secure as it did previously. Callas' vocal difficulties, including wobbling high notes, became more troublesome as the 1950s progressed, and there is ample evidence of them here. Still, in the scenes from Macbeth, Mefistofele, and Il pirata ("Oh! s'io potessi dissipar le nubi") we hear how Callas' ability to realize a role's dramatic potential fully became more powerful, the more that the voice itself was compromised. The conductors are Sir John Pritchard, Sir Malcolm Sargent, and Rescigno. This is latter day Callas at her very best, working for her repertoire and making the repertoire work for her. Her "Tu che invoco" from La vestale is a demonstration of how Classical form and proportion can actually intensify emotion, rather than stifle it under protocol. And by 1959, she had polished Lady Macbeth's opening aria into a penetrating portrait of all-devouring ambition – not pretty, but powerfully and precisely sung. Her Rosina ("Una voce poco fa") is charming and fun, but like Lady Macbeth, don't mess with her, Callas seems to say. "Tu che le vanità" from Don Carlos is imbued with an almost fatal sadness, with no loss of nobility. The recital ends with the closing scene from Il pirata. Almost 18 minutes long, this selection gives Callas the opportunity to build a more complete character than anywhere else in the program, and the result is gripping and bigger than life. Hearing Callas sing this music pretty much ruins my chances for enjoying anyone else's performance of it in the future. Rescigno is the understanding conductor, and he leads the North German Radio Symphony Orchestra. Four days later, Callas sang exactly the same program as in Hamburg. The only difference is that this time Rescigno conducted the South German Radio Symphony Orchestra! Her voice was in marginally better condition in Hamburg, and the sound on the Hamburg disc is better too. Recorded two months later, this disc is very similar to its two predecessors, except Lady Macbeth's Act One aria and Rosina's "Una voce poco fa" have been replaced by "Ernani! Ernani, involami." Again, this was a program that cannily played to Callas' strengths at the time, and that did not highlight her vulnerabilities. Again, the distant sound quality from London in 1961 lets us down. ("La luce langue" from Macbeth also ends prematurely.) In terms of repertoire, these programs are traditional, with older stand-bys (Anna Bolena, Don Carlos) mixing with recent additions (a tangy Carmen, Le Cid). "Ocean! thou mighty monster" from Weber's Oberon is a thrilling torrent of sound, albeit in not very intelligible English. Georges Prêtre takes a punishing tempo in the Cenerentola aria, and in other selections as well, but Callas keeps up with him nicely. One is struck by how healthy her voice sounds throughout; there's not much trace of a decline here. "Bel raggio lusinghier" from Rossini's Semiramide opens this program, and it naturally invites comparison with the performance of the same aria from Milan in 1956. At this point in her career, it probably was not wise for Callas to attempt this aria, and the same could be said about the Cenerentola "Nacqui all'affanno" that follows it. Her voice has thinned out in its upper register, the high notes are undependable, and overall, there is less flexibility. Still, her ability to execute Rossini's florid coloratura with precision remains thrillingly intact. On the other hand, the aria from Nabucco is even more exciting than it was in Rome in 1952, mostly because Callas pounces on it without a trace of fear. (Pity about the last note, though.) Arias from La bohème (Musetta's Waltz Song! ), Butterfly (the death scene, searingly sung), and Gianni schicchi are performed with variable vocal success, but it is in the Letter Aria from Werther that Callas shows where her career could have taken her. Charlotte is a mezzo role, of course, and it provides her with vocal and dramatic challenges that she was very capable of overcoming even at this late date. The Table Aria from Manon also is very movingly done. Georges Prêtre conducts the Orchestre National de la RTF. The sound here is excellent. An odd bonus of sorts is a private recording of most of Beethoven's "Ah! perfido," with Jeffrey Tate accompanying Callas on the piano. This item comes from the unbelievably late date of March 3, 1976 – less than two years before her death. The sound here is far from ideal, but one can hear enough of Callas to tell that the voice is more or less intact – much better than it was, in fact, during her 1973-74 concerts with Giuseppe di Stefano. What role did flagging self-confidence play in the decline of Callas' voice? It is sad to think that if Callas had received appropriate medical or psychological interventions, her career (and her life) might have been considerably longer. This interview, conducted in 1967, was presented in two parts as an intermission feature during Saturday matinee broadcasts from the Metropolitan Opera House in late 1967 and early 1968. There's no singing, just 52 minutes of Callas talking about her artistic beliefs in her inimitably analytical and didactic manner. The tone is cordial but coolly professional, and poor Mr. Downes barely gets a word in edgewise! Should you get this? If you know nothing about Callas, this probably is not the best place to start. (A compilation of her studio recordings would be a safer recommendation, or perhaps her complete Tosca.) If you have any interest at all in La Divina, however, I think you need to have this set.